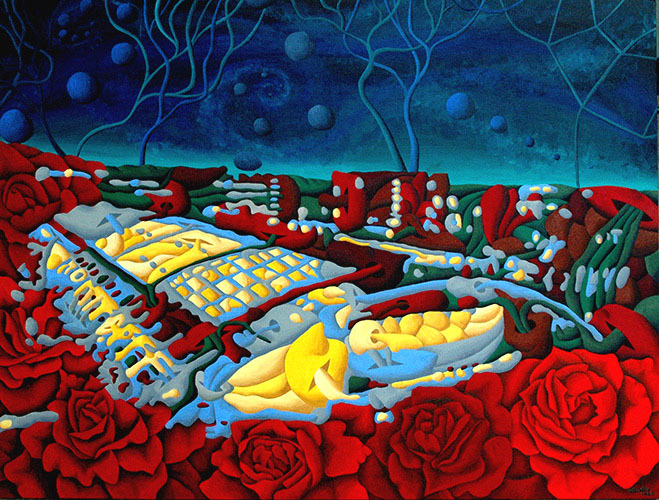 Werner Horvath: "The rosy side of Linz - Design Center", oil on canvas, 60 x 80 cm, 2008. In 2009 Linz in Austria will be Cultural Capital of Europe. The Linz-lines will participate and the project FAHR-K-ART of the Linz AG will bring art on the tickets. The artist Werner Horvath, born and living in Linz, created a painting of the Design Center for this purpose and the picture was purchased by the Art-Forum of the Linz AG.